Going to Vegas for a conference next week. 3 days in Vegas. Sounds like a movie. I've got pretty awesome meetings setup for the entire 3 days. I'll be in meetings from 8am to 10pm - with VP's from Hewlett Packard (HP). We use their technology products at my work. 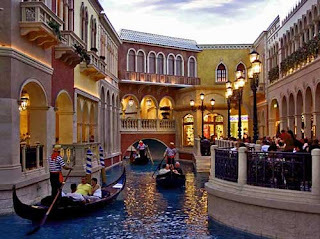 I''ll be staying in the Venetian. I'll make sure to take my camera. Should be a new experience. Guy, Kaylee and I just got back from Duluth - the weather was chilly but the air was fresh and pine-scented as always. It's just refreshing to be with family and I need these recharges. The lilacs are just all done here in the cities but just getting going up north - twice the season if you go back and forth. It was fun to celebrate Sebastian's 10th birthday - happy birthday with a SPIDER MAN cake. Also, nice to see the cabin all green and fresh. Susana and David were concerned that Marcos and Sebastian would bother us in the hotel (Radisson) but what they don't realize is that if you don't have kids it's a novelty to be around all that energy. It's fun for us and we leave feeling refreshed and rejuvenated. We toured a cabin on Strand Lake as we left - it was a dream. At only 399,000 it was a year-round home in perfect condition. The ultimate cabin with a sandy-bottomed lake out away from the main roads. I guess the neighbors are only part-timers who are up only 1 week a summer. Quiet, Quiet and Quiet. 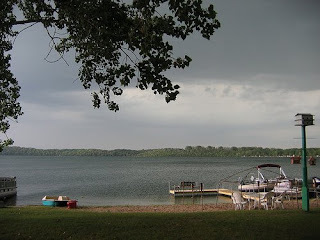 I did hear from the realtor that Strand Lake also has a party-crazed, rowdy side that gets out of control - that is odd for that area. Finally, as we were driving and winding back I opened the windows and let the cabin air in - drinking it in to stir the memories of being 10 years old on those very dirt roads. Guy said I better play the lotto and I'm off to do just that.